Soldier's Letter, 3 pages, 8vo., Camp near Falmouth, Virginia, April 5th, 1863. 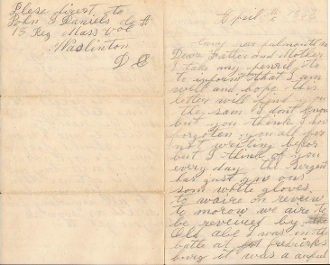 John S. Daniels (Co. A, 18th Massachusetts Infantry) writes to his parents pertaining to the Battle of Fredericksburg. "...We are to be reviewed by Old Abe. I was in the Battle of Fredericksburg. It was a awful battle but we didnt loose as many men as we did at Boonsboro. There was not a house in the city what was not torn to pieces and burnt by our shot and shell from our cannon. Even women and children was killed in their own houses..."
For full transcription of the letter, please see tha scan. Dark pencil. Very Fine and legible.